Pardon me if this is a duplicate question, but I simply could not find an answer here, on the State Department's site, or on usvisa-info.com. How long does a US embassy take to "stamp" and return an applicant's passport after a successful B2 visa interview? How long an applicant should expect to wait for an open appointment slot. How long an applicant should expect to wait after his/her interview to receive docs. 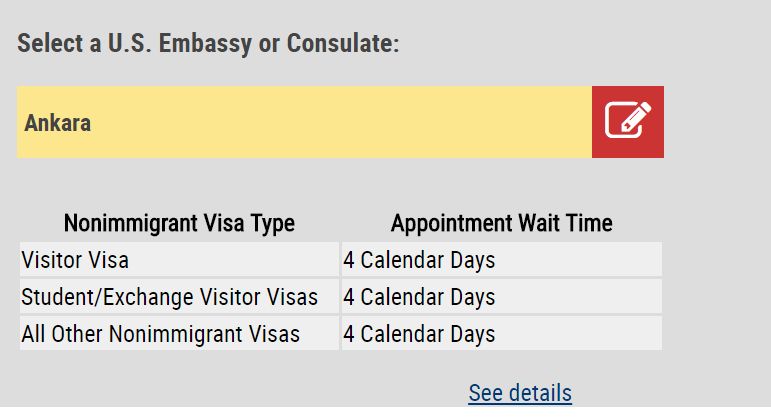 Clicking "see details" does nothing to show information about "Visa Processing Wait Times" which are explained at the bottom of the page. Note, I'm inquiring for relatives in Iran. I know their chances are practically non-existent, but they insist on applying. I ask about the processing time because they'll need to book a trip to Turkey for the interview, and they'll need their passports back before they can return to Iran. Browse other questions tagged usa b1-b2-visas turkey iran ankara or ask your own question. How long does it take to obtain a US visa for a British citizen? How to get my passport back from the US Consulate? How long does Indian visa processing take for an American born citizen of Pakistani heritage? US Consulate keeping my passport for a long period for Visa processing? Can a Canadian citizen with Iranian birth be denied entry to US to visit for 1 week?